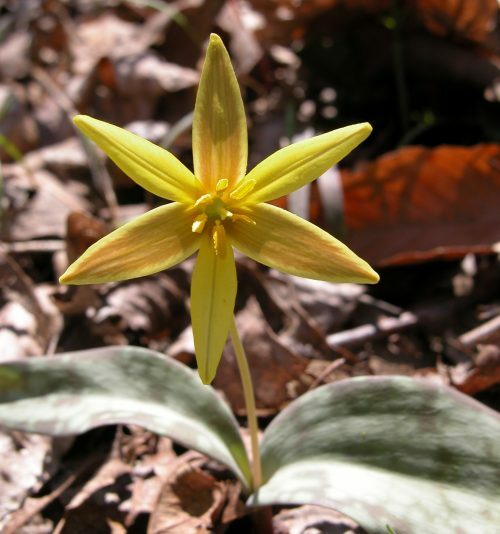 Other than a smaller population found in the Edge of Appalachia Preserve in Adams County, the lower Rocky Fork watershed of Adams County is the only known site in Ohio for the Golden Star Lily, or Beaked Yellow Fawn-Lily, Erythronium rostratum. The species is listed as an endangered species in Ohio. They are found in Ohio, Kentucky, Tennessee, Alabama, Mississippi, Arkansas, Missouri, Kansas, Oklahoma, and Texas. The species is recorded as imperiled or critically imperiled in most states in which it is found. Click here for a map of its distribution. The foliage of the Golden Star is similar in appearance to two other trout lilies in Ohio: the Yellow Trout Lily and the White Trout Lily, both of them quite common. However, the Golden Star’s flower is much showier than either the Yellow or the White. As the nodding bud begins to bloom, it slowly lifts its head and opens nearly perpendicular to the sun’s rays. The color of its anthers, unlike the red to chocolate brown hues of the Yellow Trout Lily, is bright yellow.They look like flat golden stars, hence its common name. As is sometimes the case with rare plants, where the Golden Star grows along the Rocky Fork, it is fortuitously abundant.